πBeauty Shower : Water treatment systems | IBE TECHNO CO.,LTD. Please enjoy π-water in your shower room just by changing the shower nozzle to π-Beauty Shower. 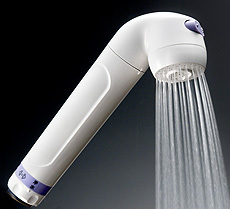 Changeable shift of original water and purified water and a switch for shower flow and massage flow are installed. 40 percent of water saving is expected.